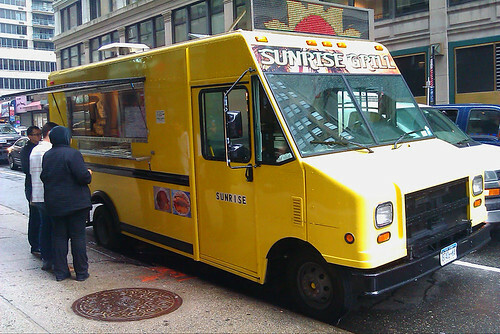 With so many food trucks roaming the streets of NYC, I still manage to get excited when I read about a new truck hitting the streets- especially when that new truck serves oxtail. Last week Lunch’er Hengde reported that Sunrise Grill (37th btw. 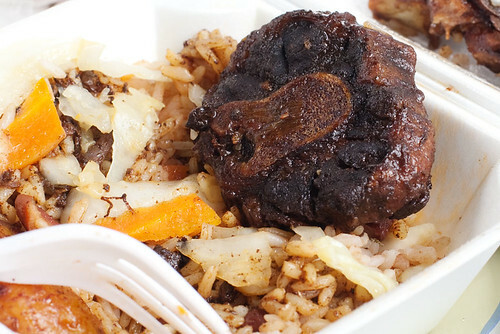 B’way+6th), a new Jamaican truck, was serving delicious oxtail with rice and beans. 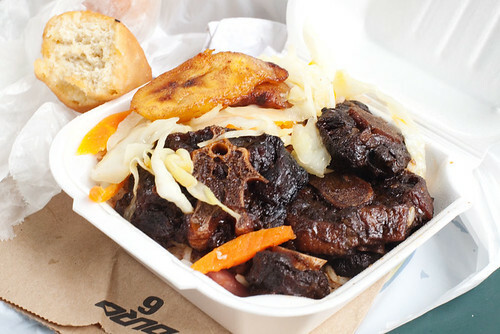 Just knowing a truck was serving oxtail was enough for me to trek out into the rain for lunch. When we arrived at the truck, I noticed the menu was different from what Lunch’er Hengde had. There was no iron ball porridge (damn and I was looking forward to trying it) and the fried plantains were a buck less. 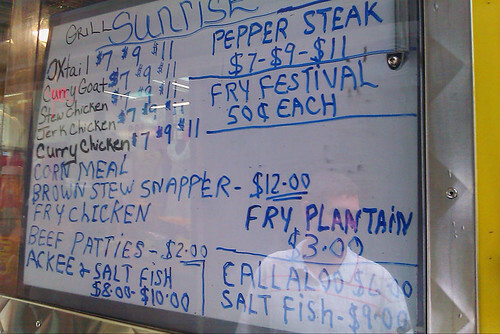 Plus there were many more items added to the menu, like a pepper steak entree, brown stew snapper for $12, fried chicken for $12 and salt fish for $9. A rotating menu on a dry erase board? I’m loving this truck even more. Man oh man, were the oxtails delicious. For something to have been cooked before and sitting in the tray (not sure how long) these were tender and had great flavors. The combination of the crunchy cabbage side, plantains, rice and beans and oxtail was excellent (I can imagine a dash of hot sauce would make it amazing). Sadly the fry festivals pretty much failed. The outside looked nice and golden but when I took a bite into it, it was all dough and super dense. These probably would have been better if there was some juice or sauce for them to soak up. Another sad thing was me bringing a vegetarian friend. I was hoping maybe he could try the porridge but since it wasn’t on the menu my friend had to ask the guy in the truck what sort of vegetarian options they had. 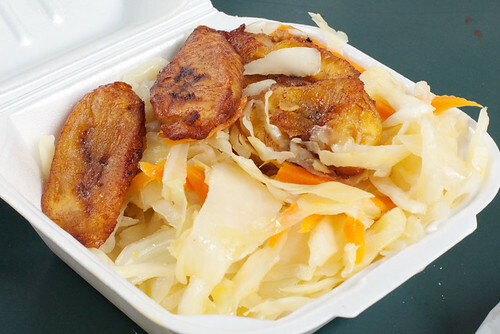 The only thing they had that was vegetarian was the cabbage side ($3) which my friend said was bland, but he was happy to find few pieces of fried plantains in the container as well. After having the oxtail I am looking forward to having more meals from Sunrise Grill. Yes the $7 option may be a tad small but that just means there is more room for beef patties ($2) or super dense fried dough (if you like that sort of thing) and still walk away for under $10. I hate to be super full from lunch so a smaller option is great. Fried plantains in my stewed cabbage! Excellent. For $7 I can go somewhere else and get a bigger lunch. I’m a vegetarian and there isn’t much options for me. 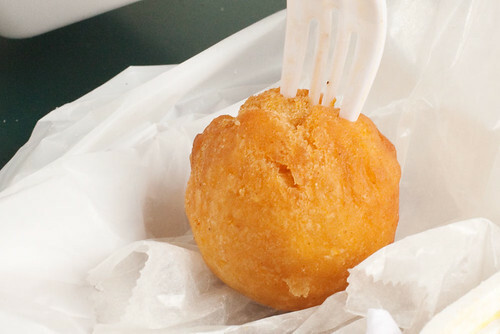 Posted by Donny T. at 11:45 am, May 23rd, 2011 under Cart, Jamaican, Sunrise Grill. The festivals were actually normal as you’re describing them. I think they’re used to soak up extra sauce, that is, anything not already soaked by the rice and beans.